My children and I love playing games together. As a home educator, I especially enjoy educational games that allow my children to learn while still having fun. 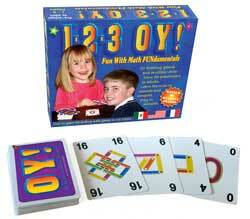 I recently found some educational card games by Dream Green that have met this need, 1-2-3 OY! and A-B-C OY!. 1-2-3 OY! is for 1-5 players and ages 4 to adult. 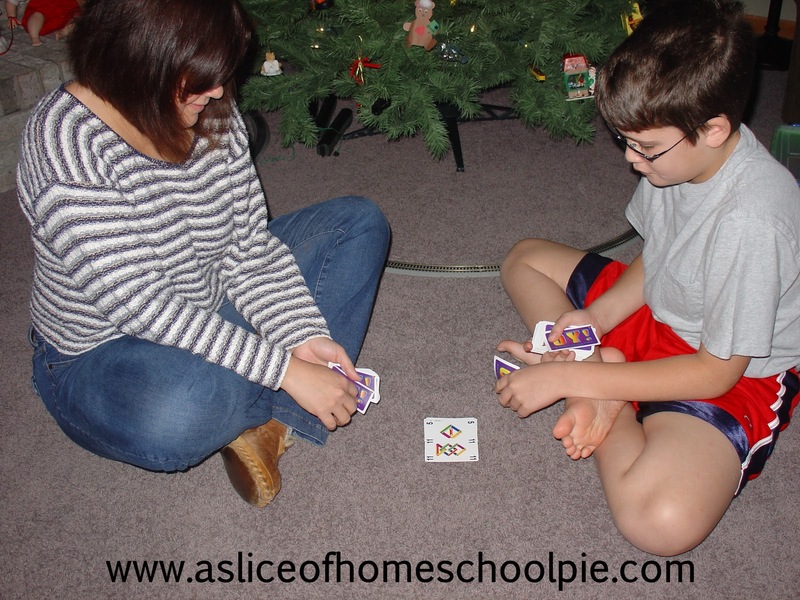 It includes a collection of 10 math card games which can be played at various levels - remedial to advance. You can use addition, subtraction, multiplication and division to make the games as challenging as you like. My 5-year-old and I like to play the game called Tots OY! in which we split the deck of cards in half. The first player puts a card down, followed by the next player. Whoever has the higher number card wins the pile. If you put down an "OY!" 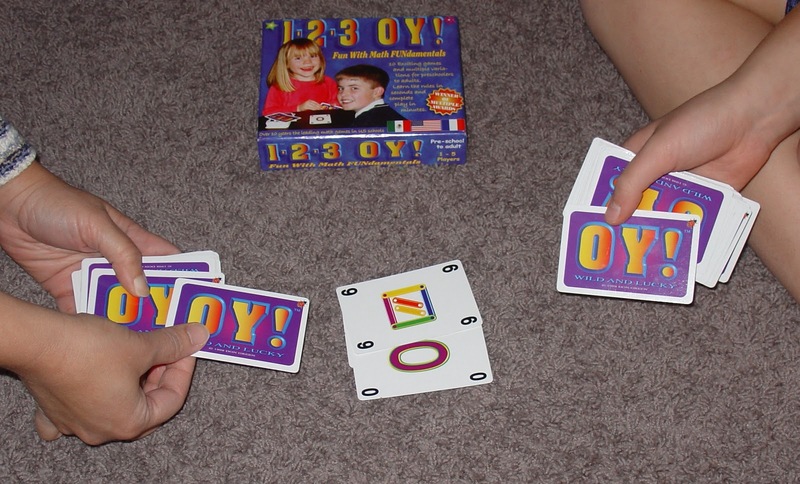 card, the first player to shout, "OY!" gets the pile of cards. The player with the most cards at the end of the game wins. I love that this game teaches my child to quickly process whether a number is bigger or smaller than another number. The faces of the 90 cards also include drawings representing their numbers to assist parents in the introduction of numbers to very young children. 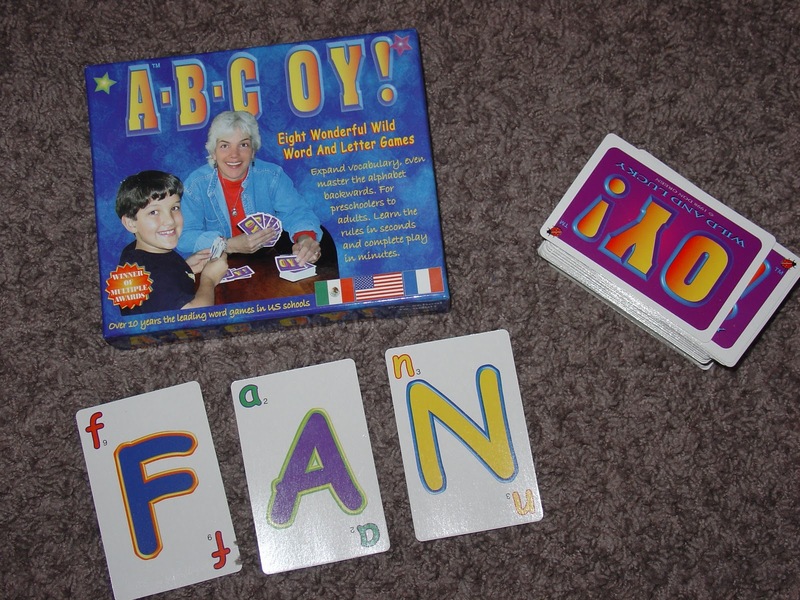 My 10-year-old and I enjoy playing Quad OY!. The dealer deals four cards to the first player. The player is required to use at least three cards to make a combination where two of them would equal the third one. You can decide how challenging you want the game to be; whether the players will use subtraction or addition, or multiplication or division. Any card not used in the combination will stay on the table for the next player to use along with an additional four cards allowing them more combination options, and therefore the opportunity to win more cards. The player with the most cards at the end of the game wins. The other game we like to play is 2 Quick OY!. The deck is split in half. The first player plays a card and the next player places a card next to the first. The players mentally add and subtract the two cards. For example, the first card placed on the table is an 8 and the next one placed next to it is a 3. When you add them together it equals 11; when you subtract them, it equals 5. 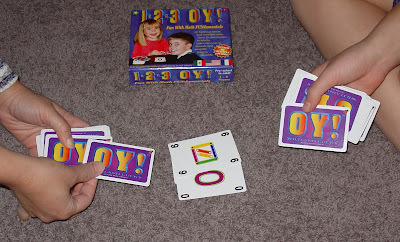 When the next player places a number card down, if the number is either an 11 or a 5, the first person to shout "OY!" wins the cards. If neither player has a solution card, then the next player places a card next to the card the previous player had laid down and a new solution is mentally calculated. For example, 6 and 3 are now the cards on the table, the new solution is either a 9 or 3. There is a downloadable PC version of this game on Dream Green's website. Whether you're proficient at mentally calculating problems quickly, or if you are more like me and need a little more time to do the calculations, either way, you will find yourself enjoying these games. Games are quick and fun. There are a variety of games with the option to play them however you choose. The price of the game is very affordable at only $10.95. The games allow my children to practice their math skills in a fun and challenging manner. A-B-C OY! is a card game with a 120 card deck that is word, alphabet, and spelling based for ages 4 to adult. 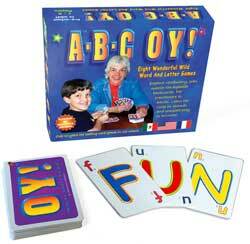 For the younger children, A-B-C OY! can be used to teach letter recognition and the alphabet. The cards include capital and lowercase letters and blank cards to use for foreign languages, extra vowels, hyphens, and apostrophes. It includes instructions for a variety of 8 games. My 10-year-old and I really enjoyed playing Quad OY! Similar to 1-2-3 OY! 's game, the object of this game is to spell the longest word. The player with the most cards wins the game. Each card also has a point system applied to it, so you could play the game in which the person with the most points win. The game is played in which each player is handed four cards. 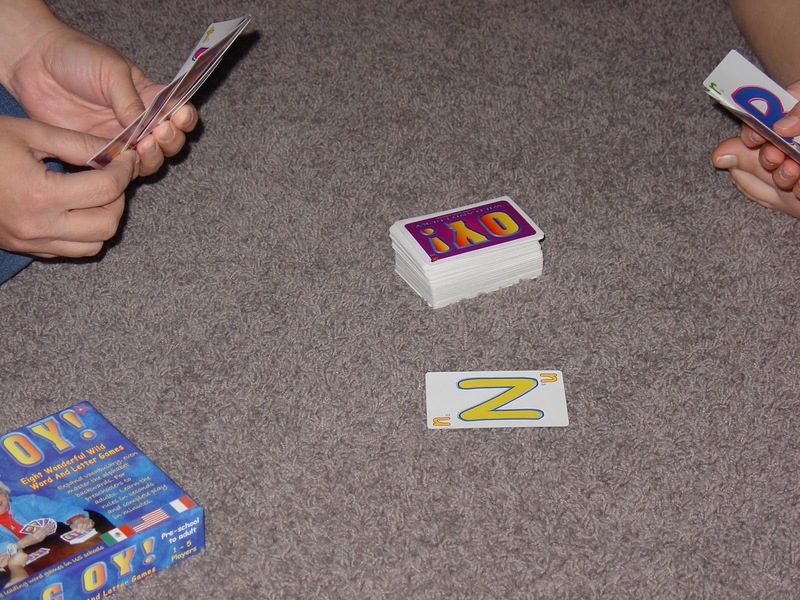 The player uses those cards to spell the longest word possible so that he can keep those cards. Wild cards (the OY! cards) can be assigned a letter. Any cards not used, will be used by the other player in building his words. If all four cards happen to be consonants, then another four cards are dealt. You continue to play until all the cards are used. Another game you can play is called Slap, Spell, OY! In this game each player gets 9 cards. Depending on the level of your child's spelling, you may choose to play with fewer cards. My son and I started with 5 cards. One letter card is placed face up. You must then use that letter along with any letter cards you have in your hand to spell a word before your opponent. Again the winner with the most cards (or the highest points) wins the game. The games can be adapted to a variety of ages and skills. Although there are 8 games, you can use the cards for a variety of language arts skills. It allows my children to practice their spelling and other language arts skills in a fun and challenging manner. Both of these card games would be a fun and affordable Christmas gift. In fact, this could be an early Christmas gift for you as Dream Green is offering one of my readers a chance to win their choice of either the 1-2-3 OY! or A-B-C OY! card game. To enter use Rafflecopter below. Disclosure: Dream Green provided me with both 1-2-3 OY! and A-B-C OY! card games to review on my blog. The opinions I have given are mine and may differ from others but were not influenced by the company or the free product provided. I'd like to win the 1-2-3 OY!